[Thursday, February 1, 2007] On Wednesday, NASA agreed to cooperate with PlanetSpace Inc. and Transformational Space Corp. (t/Space), to facilitate the commercialization of low-Earth orbit as they develop capabilities to transport goods and people to orbital destinations. [Monday, February 5, 2007] NASA has lost an 18-month legal battle with California-based American Small Business League, forcing NASA to provide detailed information that proved the agency had exaggerated its small business contracting statistics for 2002, 2003 and 2004. [Tuesday, February 6, 2007] "This morning, the President announced his fiscal year 2008 budget request for the Federal Government. This includes a $17.3-billion request for NASA, which is a 3.1-percent increase over the President's fiscal year '07 request for the agency." [Thursday, February 8, 2007] NASA has issued a request for information soliciting ideas on ground processing services for its Constellation Program and the next generation of space vehicles. [Saturday, February 10, 2007] Ground processing will provide important services at KSC to support Ares I, the Ares V, and the Orion Crew Exploration Vehicle beginning with the Constellation Program Flight Tests and continuing through the ISS and Lunar missions. [Saturday, February 10, 2007] NASA invites you to submit a response to this inquiry to assist in developing plans for the long-term management for Constellation data and defining evaluation criteria. [Saturday, February 10, 2007] JSC has a requirement for highly specialized analysis of the space exploration industry of the type typically provided by a venture capitalist. This service is to support the Commercial Crew and Cargo Program Office and the COTS Demonstrations. [Saturday, February 10, 2007] NASA/ARC has a requirement for support for the Lunar Crater Observation and Sensing Satellite (LCROSS) Mission and the development of future mission concepts. [Sunday, February 11, 2007] "This is the second year in a row that the National Space Club has asked me to speak at a luncheon soon after we rolled out NASA's annual budget request to the Congress, so by the standards of the space business, it is now a tradition." [Tuesday, February 13, 2007] The world's first private female space explorer, Anousheh Ansari is writing a memoir with the assistance of Homer Hickam, author of the No. 1 New York Times best-seller "Rocket Boys," which was made into the critically acclaimed movie "October Sky." [Tuesday, February 13, 2007] Charles Simonyi, Ph.D., the fifth private space explorer, announced today that his Web site www.charlesinspace.com, now features rich new content including training video and personal interviews. [Wednesday, February 14, 2007] Loretta and George Whitesides, the first couple to honeymoon in space, launched a new website on Valentine's Day to share the excitement of their upcoming adventure with the public. [Thursday, February 15, 2007] Arianespace and Astrium Space Transportation have decided to increase the Ariane 5 production rate, with the company's two top executives confirming the output ramp-up by signing a declaration today in Bremen, Germany. [Friday, February 16, 2007] The Government Accountability Office (GAO) released a report today on procurement practices at the National Aeronautics and Space Administration (NASA) that identifies a number of problems with the agency's management of its contractor award fees. [Friday, February 16, 2007] Two companies that are receiving NASA Commercial Orbital Transportation Services funds achieved significant milestones this month in their efforts to develop and demonstrate space cargo launch and delivery systems. 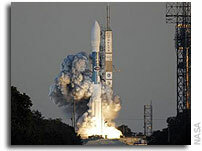 [Saturday, February 17, 2007] A Delta II expendable launch vehicle successfully launched NASA's THEMIS spacecraft today marking the first east coast mission conducted by United Launch Alliance (ULA) since its formation Dec. 1, 2006. [Monday, February 19, 2007] XM Satellite Radio and SIRIUS Satellite Radio announce that they have entered into a definitive agreement, under which the companies will be combined in a tax-free, all-stock merger of equals with a combined enterprise value of approximately $13 billion. [Tuesday, February 20, 2007] The intent of this contract is to obtain support of reduced gravity research by aircraft approved by NASA for reduced gravity flight. [Tuesday, February 20, 2007] The Coalition for Space Exploration today announced a partnership with the Texas Space Grant Consortium to sponsor the 2007 NASA Means Business competition. [Tuesday, February 20, 2007] NASA/GSFC plans to issue a DRFP on Feb 19, 2007 for the procurement of two TDRS Program spacecraft, designated K and L, with separate options for two additional spacecraft, designated M and N in support of the Space Operations Mission Directorate. [Tuesday, February 20, 2007] The Emergency Egress System (EES) is planned to provide a safe mode of emergency egress from the CEV to a safe location via a multi-vehicle, rail system for the flight crew, closeout and contingency crews, and ground operations personnel. [Wednesday, February 21, 2007] NASA signed a MOU Tuesday with Virgin Galactic, LLC, to explore the potential for collaborations on the development of space suits, heat shields for spaceships, hybrid rocket motors and hypersonic vehicles capable of traveling Mach 5. [Wednesday, February 21, 2007] Spacehab today announced that the Company has filed for a formal dismissal with prejudice of all litigation against NASA relating to losses incurred by SPACEHAB as a result of the 2003 Space Shuttle Columbia accident. [Wednesday, February 21, 2007] Future trends in the markets for civil and military aircraft, aero turbine engines, UAVs, defense electronics, and satellites will be the topics of Aerospace Markets - The Decade Ahead, a Teal Group forum presented by the AIAA. [Thursday, February 22, 2007] The memorandum is only a framework to explore potential collaborations. It does not include training of NASA astronauts, an agreement to buy seats on a Virgin Galactic flight, or provision of technical advice by NASA to Virgin Galactic. [Friday, February 23, 2007] NASA will conduct a single overview session with Industry on March 6, 2007. This session will be held with the declared Upper Stage Production potential Prime Contractor Teams who previously responded to the Notice of Intent. [Monday, February 26, 2007] Construction of the Soyuz launch site in French Guiana was opened today by Jean-Jacques Dordain, ESA Director General, Yannick d'Escatha, President of CNES, Jean-Yves Le Gall, Director General of Arianespace, and Anatoly Perminov, Head of Roscosmos. [Monday, February 26, 2007] Astrium is set to build the Mercury probe BepiColombo on behalf of the European Space Agency, ESA. [Tuesday, February 27, 2007] XM Satellite Radio Holdings Inc. today reported financial and operating results for the fourth quarter and full year ended December 31, 2006. [Tuesday, February 27, 2007] NASA has completed a modification to convert the letter contract with USA, to a fully defined contract covering space shuttle and ISS program operations for a base period from Oct. 1, 2006, through Sept. 30, 2010. The contract is valued at $6.34 billion. [Wednesday, February 28, 2007] "On Feb 15, 2007, the President signed into law a joint resolution stipulating FY 2007 funding levels for NASA and other Federal agencies. This appropriation reduces overall funding for NASA by $545 million from the President's FY 2007 request. "